What does farmer’s despair over crop failure have in common with dengue fever, which is ravaging Delhi and other cities of India? Seemingly nothing. But dig a little deeper and you will find that in both cases variable and erratic weather is at the root of these tragic events. There is another connection: lack of governmental policy, action and, quite frankly, callous neglect that has made both events even more horrific and painful. Last fortnight, I wrote about the killing fields of India, where unseasonal, extreme and deficient rainfall had driven farmers to despair. It is clear that this variable weather is not a freak event, but points to the changes that are beginning to influence our monsoon lifeline. It is equally clear that current policies exacerbate agrarian distress. It is farmers who pay with their lives. This fortnight, it is vector-borne disease dengue that is taking lives. The most heartbreaking incident was of a child whom hospital after hospital in capital city Delhi refused admission. Devastated parents jumped off their roof. They could not face life anymore. Many more cases in Delhi and across India have emerged. One explanation for the virulence this year is that the mosquito has a four-year cycle, and this is its peak year. Another explanation is that it is a different serotype of the dengue virus; or that Aedes aegypti and Aedes albopictus, the two mosquito species that transmit the dengue virus, have mutated and become more harmful. But these suppositions do not add up to explain the extent of damage this mosquito has done this year. Explanation for that lies somewhere else. One is this year’s strange weather. There has been periodic rain, which is followed by days of intense heat. Down To Earth reports about global studies that point to how risk of dengue increases in such situations. 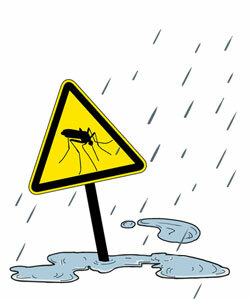 Unseasonal rain in February and March not only damaged crops, but also prolonged the season for mosquitoes. Climate changes will make the environment conducive to mosquito breeding, show all models on impacts. But we just do not listen. It is time we stopped debating the C word. Climate change is here in terms of weird weather events and its impacts will only grow as the runaway temperature, caused by our fossil fuel addiction, continues to spiral out of control. This is still only one part of our challenge. The other reason behind dengue’s deadliness is sheer mismanagement of health services and shockingly bad governance. In Delhi, the current elected state government is locked in a war with the other elected national government. In this game of one-upmanship the casualty is governance. Such environment is not ideal for any real developmental action. What thrives instead is meaningless politics and a highly polarised discourse. In all this, our health services are neglected. We have not invested in building public infrastructure to provide basic and now tertiary services. It is the most odiously oft-repeated statement that India’s investment in health services remains one of the lowest in the world. The assumption is that the government does not need to do anything; instead as people get rich, private health services will spread and more than adequately fill the void. If people cannot pay, then insurance companies will step in and this will certainly fill the void. But as the dengue crisis shows, without public infrastructure, or at the very least public regulation to keep costs in check, people will die. Today, to manage this public health crisis, the government has capped the price of laboratory tests and vacated beds in public hospitals—sent other equally ill people home—to take care of the dengue epidemic. This is no way to go about dealing with dengue. All this will not work if we do not prevent diseases—in the case of dengue, clean our environment to make sure that whatever the adverse weather changes the mosquito does not breed. There is some evidence that dengue mosquito, which earlier bred only in clean water is adapting rapidly to our dirty environment. All this means, once again, that we cannot have piles or ponds of garbage and polluted stagnant water. Our municipal services cannot fail. We cannot fail. And it can be done. Many years ago, our experiments with bio-vector control—in Puducherry and later in Kheda district of Gujarat—showed a dramatic reduction in vector-borne diseases. In these cases, what was done was aggressive cleaning of the environment to make sure there was no stagnant water in drains and use of fish larvae to eradicate the mosquito. Basic stuff. Climate change has only magnified our already existing risks, whether in the case of farmers or in the case of dengue. The growing impacts of climate change in terms of weird weather tell us that we do not have the luxury of time anymore. We need to get our act together, and act. Fast. Instead dumping every thing on climate change, it is worth to spend time study on the subject taking the scenario from 1947 to date in Delhi. Then you get the real cause for the farmers suicides and diseases like dengue. Also, don't blame the government, now. In India, for that matter all over the globe, there are certain places where encounter certain type of diseases. For example, Guntur the new AP capital zone was famous for Malaria [I have experienced this in 60s] -- with poor sanitation along with Pigs freely roming. This is also hot zone.